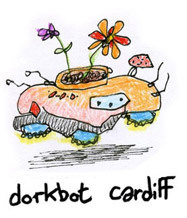 Thanks to Paul Granjon and Pete Hathaway for inviting me to come and talk at Dorkbot Cardiff next week. Other speakers include Dr Nick Lambert, Chairman of the Computer Arts Society & Olivia Kotsifa, who is involved in the Cardiff Fab Lab project (an MIT project). I went to the Nairobi Fab Lab (with Paul Granjon) back in 2010 which was amazing, so it’ll be great to see those facilities in Wales too. I’m going to be talking about some Arduino projects, plywood, pointlessness, momento mori and microrenewables. It’s on next Thursday 6th Dec at Milgi’s on City Road. More on the Dorkbot Cardiff website.